Dominion Energy is at it again, using its political influence to push legislation that would weaken oversight by the State Corporation Commission and boost profits at the expense of its Virginia customers. But this time something is different. The corporate giant is being met with significant opposition. Last week, a bipartisan group of lawmakers requested that the bills be put on hold and asked the SCC — the independent agency that governs utilities in Virginia — to analyze the impacts of the bill. Yesterday, that analysis was released and it is jaw-dropping. Dominion’s proposal is even worse than we initially thought. The SCC’s analysis found that the bills could result in customers having to pay double for some projects, and add billions more in ratepayer costs ver the coming years. In what is now a familiar Richmond ritual, Dominion Energy is back at the General Assembly with its latest attempt to defang regulators and keep electricity rates artificially inflated for the more than two-thirds of the commonwealth’s consumers in its monopolized territory. Nothing new there. But there are signs this could be a watershed moment in Virginia politics. What’s utterly unprecedented this year is the force of Virginians’ response — and the fact that, this time, the state’s most powerful special interest might not get its way. Dominion faces an escalating backlash against the corrupting influence of its political spending — widely known to be the highest in Virginia of any corporation. November’s election of 13 delegates who bucked the system by running on a pledge to refuse Dominion money resulted in a swift erosion of the company’s political dominance. The victors were propelled to office largely by voter outrage over Dominion’s proposed Atlantic Coast Pipeline, its failure to properly clean up its toxic coal ash disposal sites, and the galling money grab it rammed through in the 2015 “rate-freeze” bill that siphoned hundreds of millions of dollars in “overearnings” from consumers’ pockets into its corporate coffers. 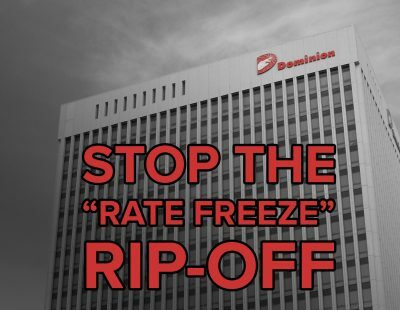 And the public and political rallying cry has only grown since legislators introduced a package earlier this month, supported by Dominion, to keep rates high and jack up its profits. The bills are designed to change the underlying process for setting electric rates in order to increase Dominion’s ongoing profits and roll back the oversight authority of the SCC, which is charged with protecting the public interest. Virginia has the 10th highest electric bills in the country, and average residential Dominion bills have increased 30 percent since 2006. What Virginia families and businesses need is a stronger SCC, not a weaker one. Here’s an analogy for what Dominion is trying to get away with. Imagine the IRS operating under the rules Dominion wrote back in 2007. Say you overpaid your taxes by $1,000. Rather than giving you a full refund, the agency would credit you $700, or less, keeping the remaining $300 as profit. As if that weren’t bad enough, you would be far worse off if the IRS were operating under the most charitable possible reading of the rules that Dominion wants to pass this year. In that case, the agency could decide not to pay you back at all. Instead, it could invest your $700, without your consent, on projects or programs of its choosing, and charge you an additional $70 or so (a state-mandated profit called a “Return on Equity”) for its effort. Virginia has already earned the dubious distinction of being “one of the top state regulatory environments for utilities in the U.S.” according to a Goldman Sachs report last year. The key phrase there is “for utilities,” since Goldman is referring to the shareholders’ perspective, not to those of us who are paying the bills. Passing Dominion’s proposed legislation would all but complete its conquest of the checks and balances that were created specifically to prevent the unchecked accumulation of money and political power by corporate monopolies. It’s time for the General Assembly and Northam to break this cycle and restore a fair deal to Virginians. We can’t let Virginia politicians forget that they represent you and me, not Dominion. Raised in the Blue Ridge mountains of Cashiers, N.C., Kate has contributed to numerous climate, coal and clean energy campaigns throughout her career at Greenpeace, Rainforest Action Network and now Appalachian Voices. In her role as Deputy Executive Director, Kate’s deep-rooted experience in campaign strategy and execution helps ensure the success of each of our programs.